Fresholi Bites: Feast Thine Eyes!!! I have a friend who happens to be a very creative soaper and she makes the most wonderful creams (how fortunate for me :o)). Anyway, I popped around her house yesterday for a quick chat as she prepared for a craft show. I went through the back gate and walked up to her workshop and lining the small forecourt was a delight to behold. All these lovely, rustic-looking baskets and wooden boxes filled with wonderful chunky bars of soap, creams, bath salts and other goodies. Wow I thought. All the soapies were bare and naked and not one single bar looked like any other. There is something about that which really appeals to me. It is like each bar is an individual, has a personality all of its own. Although I have seen her work many times before, on the drying racks of her workshop, there was something really special about she had arranged the bars, simply and without pretence in these boses. Just a simple and honest exclaimation of what she had to offer. Amazing really, I felt almost compelled to say "I'll take one those, two of those and.... ooh, one of those please". She also had these wonderful gift bags and boxes that screamed natural goodness. A really perfect gift for someone special and as I picked up this and sniffed that, I was thinking 'hmmm.... this would be lovely for so and so for Christmas'. It just goes to show though, that presentation is everything and it doesn't need to be all posh, neat and uniformed. In fact, I think we consumers have probably become somewhat immune to that kind of presentation that it no longer effects us. We could easily walk by that. No, this simplistic and open way was so honest, eyechatching & homely and Keilly's love & passion for what she does really shines through. I know she did really well at the show and my goodness, why wouldn't she? Although I do hear she spent a good chunk of anything she made buying stuff from other stalls, lol. 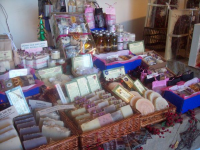 Anyway, she kindly allowed me to publish some pictures of her stall (which apparently was in stables - how quaint?). 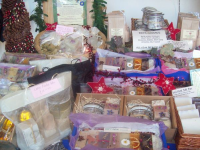 Keilly is the founder of Mad About Nature and makes handcrafted soaps, creams and bath products from natural ingredients. 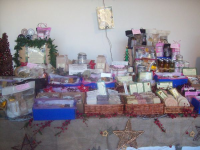 A passionate creator with a great range of products (the gift packs are to die for). http://www.madaboutnature.co.uk/ is available online and will be showing at numerous events around the country (event calender can be viewed on the site).